Each volume in the series combines evocative writings with a fascinating tour of conservation news highlights and vital statistics from around the world. One-third of each volume focuses on a topic of particular concern to conservationists working to protect wildlife and our last wild places. This 2008–2009 edition considers the integration of wildlife health, ecosystem health, human health, and the health of domestic animals—a “One World–One Health” approach to disease and conservation. This focus is complemented with essays clustered into sections that address other key issues—conservation of species; conservation of wild places; people, culture, and conservation; and the art and practice of conservation. Essays cover a broad range of topics, from restoring biodiversity on the prairies to mapping the state of the oceans to the conservation impacts of lawlessness and coca cultivation in Colombia. Essay contributions come from people directly involved in on-the-ground conservation efforts and offer a unique and valuable perspective on often-overlooked topics. State of the Wild’s accessible approach educates a wide range of audiences while at the same time presenting leading-edge scientific overviews of hot topics in conservation. Uniquely structured with magazine-like features up front, conservation news in the middle, and essays from eminent authors and experienced scientists throughout, this landmark series is an essential addition to any environmental bookshelf. 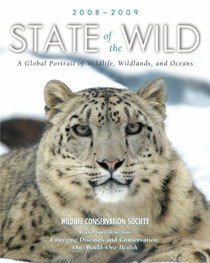 "Students and conservationists alike will find the 2008-2009 volume to be valuable...WCS's authors have presented thoughtful, ethically responsible views on how to balance the needs of wildlife and humans to provide for the health of both." "Accessible to anyone concerned with wildlife-human interactions, this book is an especially valuable reference for conservation biologists." "For anyone who wants to feel up to date on the state of conservation in the world, this book will provide a succinct, comprehensive, attractive, and well-written summary of what one needs to know." "This book provides a comprehensive data-based review and assessment of the state of the world environment. It is also a model of clarity...I can only recommend this book to all those interested in the state of our environment." "I can truly say that this is one of the more interesting and informative books that I have read concerning the state of our environment, the role of humans in that environment, and how individuals and groups are working to 'save' aspects of the wild and wilderness"
Chapter 12. Conservation Controversy, To Cull or Not to Cull? Chapter 23. Conservation Psychology: Who Cares about the Biodiversity Crisis? Chapter 24. Biogenetics and Conservation: Celebrate or Worry?